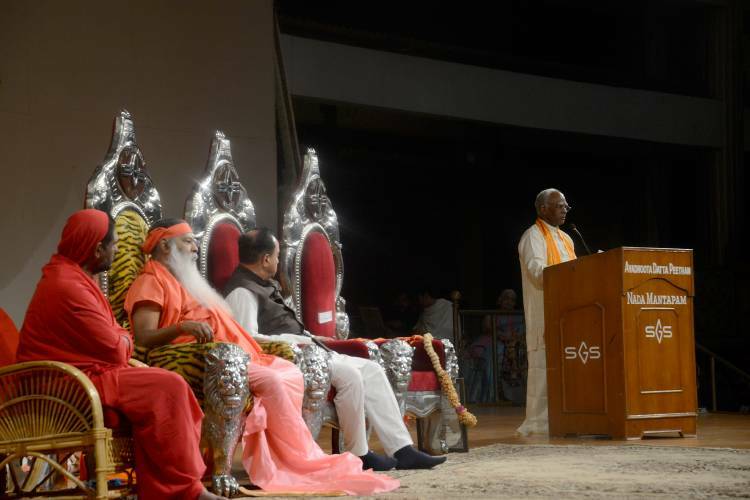 I want to express my deep appreciation to our Sadguru ParamapujyaSri Ganapathy Sachchidananda Swamiji and His Holiness Sri Datta Vijayananda Teerdha for honoring and also giving me the opportunity to speak on the occasion of conferring “Vishwa Hindu”award. My association with Sri Swamiji started in 1990. In 1993 Sri Swamiji blessed me be the Chairman of Datta Yoga Center USA. Over this period, directly or indirectly, silently or verbally Sri Swamijiinstilled many ideas, influenced many values, shaped the moral compass, instilled discipline, helped to appreciate the richness of Hinduism, inspired me to look at the need for preserving the grandeur of our faith, motivated me to do my dharmic duty to my faith,appreciate the Guru tattva concept, and many other ways. Distraught by the plight of Hindu Temples, distressed by the discriminatory take over of the Temples, disturbed by the large scale abuse of the temples, agitated by the near total indifference of Hindus toward their religion, I along with many other friends started Global Hindu Heritage Foundation was in 2006 with a sole mission to work toward the REPEAL of Endowment Act. This is the only major decision I made without seeking Sri Swamiji blessings. Because, I was so passionate about the cause, it was so painful to see the animosity, hatred, discrimination against Hindu Temples by the government, and it was an excruciating experience to see the indifference by Hindus themselves, I felt at the time, that I would be devastated mentally, if Sri Swamiji did not approve of my getting involved in GHHF. Any way, I want to express my appreciation to Sri Swamiji and Sri Bala Swamiji for their visible as well as invisible, direct and indirect support for our efforts. The song “Bharata Mata Sevakai bhratukunanta daaraboi’ (meaning sacrifice your life to do seva to Bharata Mata) by Sri Swamiji and the chorus “Bharatamata ki Jai” (meaning Victory to Bharata Mata) are so powerful, so capturing, so mighty, and so relevant for all times and the eternal message of that song left indomitable imprint on my mind, evoked sense of responsibility as a child of Baratamata, and inspired me to do my dharma, however infinitesimal may be, to my Mother Land. The gist of the song, according to my own impression, is that we need to sacrifice our lives in serving Bharata Mata. Sing with one voice loudly by opening your hearts to bring back the glory, grandeur, splendor and magnificence of Bharata Mata by arresting our selfishness, egocentrism, greediness, narrow mindedness and we all should fight with might for the welfare of our people. Let us not put wedge between rich and poor and work together in unison for the welfare of the nation. Let us all pray for Divine Blessings to give us enough strength to serve our fellow human beings. Spread the fragrance of Sachchidananda to every one through the message of Lord Dattatreya. 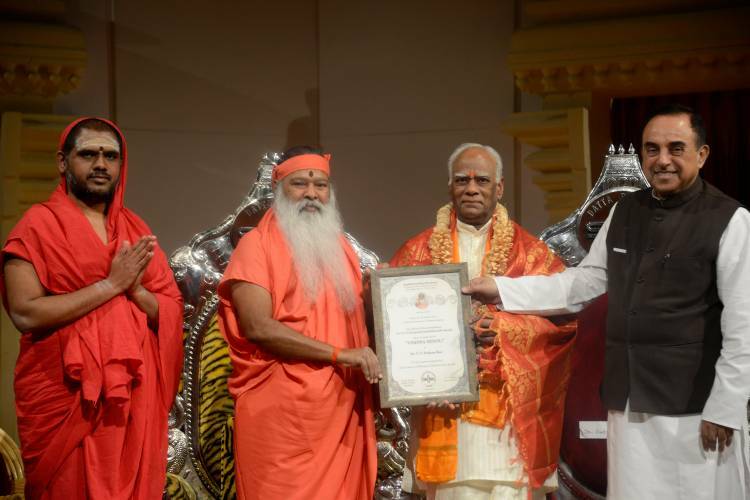 "Vishwa Hindu" Award presented on December 16, 2013 at Avaduta Datta Peetham, Mysore. Sri Vijayananda Teertha Swamiji. Sri Ganapathi Sachchidananada swamiji, Dr. V V Prakasa Rao and Dr. Subramanian Swamy are seen in the picture. Then why would Sri Swamiji compose and sing that song with so much passion, so loudly in a piercing voice to capture the attention and inspire the listeners? Why would he ask us to fight for Bharata Mata? 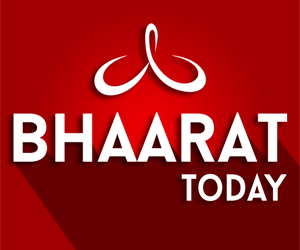 What is so great of Bharata Mata? Let us ask ourselves a question? Do we think Sri Swamiji would compose such a song unless he felt the message of universal brotherhood, universal tolerance, nonviolence, independence, liberty, freedom and genius of human mind, espoused in Vedas and other scriptures, is the need of the hour for the peaceful coexistence and survival human race itself? If Sri Swamiji has not sensed the direction the Bharata Mata is going and abrogation of her children’s’ responsibility to their Mother, do you think this admonition would have slipped from His lips. To know more about Bharata Mata, what it stands for, how her children enjoyed the riches and compassion, let us look at the tapestry of her sacred land over the millennia. In order to grasp the richness of our culture, to understand the grandeur of our civilization, to admire the scientific advancements, to appreciate the depth of the genius of Hindu mind, to wonder with awe the beauty of architectures of Hindu Temples, to realize the impeccable ethical and moral compass, to comprehend the philosophy of ahimsa, to fathom the diversity of the wide variety of scriptures, to visualize the value toward freedom and liberty, and to applaud the unbridled intellectual freedom, we have travel back to 2 to 3 thousand years to find out how our ancient rishis have shaped our society and handed over the only civilization that has not been demised. It is not just enough to appreciate, laud, and pride our selves in the past glory. Bharata Mata is being neglected, ignored, abused, stabbed, suffocated and being subjugated in all directions and from all communities, within and without, may be even mercilessly. Not long ago, Hindu art, temples and religion have flourished in Burma, Tibet, Nepal, Mongolia, Sri Lanka, Java, Thailand, Indonesia, Malaysia, Korea, Philippines, Siam, Siberia, Vietnam, Japan, China, Russia and many South America countries. Many Middle Eastern countries have imported the culture from India. It is through mere strength of our philosophy, our fables, our morals, our gentleness, our tolerance, our scriptures, our Itihasas, our creativity and our love for others; India was able to exercise great influence on the cultures of other countries. As former Chinese Ambassador to USA, Hu Shih observed: "India conquered and dominated China for 20 centuries without ever having to send a single soldier across its border." Many scholars, travelers, businessmen, administrators and voyagers visited Bharat for many centuries. They were surprised shocked admired and appreciated Bharat in so many ways. Others with interior motives, believers in exclusivity, and a mission to insult the Mother did their ratchet work. Let us look at what they found. Megasthanese, who visited Bharat in 4th century BC during Chandragupta time, observed: "They live happily enough, being simple in their manners, and frugal. They never drink wine except at sacrifice ...The simplicity of their laws and their contracts is proved by the fact that they seldom go to law. They have no suits about pledges and deposits, nor do they require either seals or witnesses, but make their deposits and confide in each other ... Truth and virtue they hold alike in esteem . . . The greater part of the soil is under irrigation, and consequently bears two crops in the course of the year.... It is accordingly affirmed that famine has never visited India, and that there has never been a general scarcity in the supply of nourishing food." Yuan Chwangtells us: "They do not practice deceit, and they keep their sworn obligations . . .. They will not take anything wrongfully, and they yield more than fairness requires." In sixteenth century Abul Fazl reports that the Hindus were "religious, affable, cheerful, lovers of justice, given to retirement, able in business, admirers of truth, grateful, and of unbounded fidelity." Keir Hardie, the British Judge observed that the Hindus honesty is well known. “They borrow and lend on word of mouth, and the repudiation of a debt is almost unknown. I have had before me hundreds of cases in which a man’s property, liberty and life depended upon his telling a lie, and he has refused to tell it." About 150 years ago Mark Twain observed India as the "Land of religions, cradle of human race, birthplace of human speech, grandmother of legacy, great grandmother of tradition. The land that all men desire to see and having seen once even a glimpse, would not give that glimpse for the shows of the rest of the globe combined." Bharat has produced many kings, administrators, Gurus and advisors who never swerved from truth and justice. Lord Rama, whose reign was called Rama Rajya, set the trend. Rama is known for following the path of Righteousness and Truth. People were happy and healthy and were not afflicted by diseases.Rama Rajya was marked by peace,prosperity,and harmony. We all remember the adage yatharaja tathapraja.As the king,so were the subjects.As the king, so were the ministers, the advisors and the administrators. They were firm in their adherence to truth and righteousness. The guiding Vedic principle“Sathyamvadadharmam chara” was the ideal to be followed in the kingdom.It means speak the Truth and practice Righteousness.Let us remember the state of Bharata Mata in Vedic period. In one of the Upanishads, a King, responding to a question by a visiting Rishi regarding the state of affairs in his country, says: "In my kingdom there is no thief, no miser, no drunkard, no man without an altar in his home, no ignorant person, no adulterer, much less an adulteress. King Sri Krishnadeva Raya, who ruled Vijayanagar that included the city of Mysore, led a life of justice and courtesy, gave abounding alms, enjoyed and supported literature and the arts, forgave fallen enemies and spared their cities, and devoted himself sedulously to the chores of administration. In 1443, Abdu-r Razzak,who saw Vijayanagar reported it as"such that eye has not seen,no rear heard,of any place resembling it upon the whole earth. "A Portuguese missionary, Domingos Paes (1522), describes him “as the most feared and perfect king that could possibly be; cheerful of disposition, and very merry; he is one that seeks to honor foreigners, and receives them kindly… He is a great ruler, and a man of much justice, but subject to sudden fits of rage . . .. He is by rank a greater Lord than any … but it seems that he has in fact nothing compared to what a man like him ought to have, so gallant and perfect is he in all things." Let us look at one more example of King Harshavardhana. A Chinese traveler who visited the kingdom during that period and who had first hand experience observed “Every five years he conducted a great festival of charity by inviting all officials of all religions, and all the poor and needy of the realm. At this gathering it was his custom to share the surplus brought into the state treasury.” All were fed and they distributed pearls, garments, flowers, perfumes, and one hundred pieces of gold to all the subjects including poor and orphans during that festival that lasted 3-4 months. At the end King Harshavardhana divested himself of his costly robes and jewelry, and added them to the alms. We can see how our ancestors followed the principles of Ramarajya where kings treasure was considered belonging to the subjects, not for hoarding, not for exploitation, not for personal amassing, not corruption and not for personal riches. Riches are distributed to the rightful owners – the people, not to the greedy, gluttonous and grabbing people. That is what Bharata Mata evokes in our mind. She is calling for few good men like you to come for her rescue. That is what we need to work for and sacrifice our lives. As M. Brieux, a member of the French Academy, writes: "The noble minds of India, without having had the necessity of having recourse to experimental science like us, discovered the truths which we discover after them. By the unaided power of meditation, they have given an explanation of the universe which appeared ridiculous to us for a long time, but which our scholars are now beginning to accept." Just imagine our great Maharishi’s concentration, achieved by the meditation and yoga, how they dissected the every aspect of the entire universe with no scientific tools or laboratories. Every conceivable aspect such as the origin of cosmos, trigonometry, algebra, mathematics, biology, chemistry, calculus, human anatomy, physics, engineering, technology, medicine, dentistry, time scales, speed of light, and so on. It is difficult to find a subject that has not been pondered, deliberated, contemplated, investigated, dissected, and probed. They have done it through their power of concentration and laser like focus. 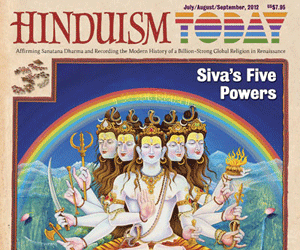 Hindu mind is ingenious, inventive, imaginative, creative and inspirational. It is known as Yogic mind, Dharmic mind, Atmic mind, Vedantic Mind, etc. Hindu mind invented zero and calculated the Phi. It penetrated into every nook and corner of the cosmos. Nothing is left out. Not only the Hindu mind analyzed them, they have done with accuracy that surprised the most modern scientists and may have surpassed them. The late astrophysicist Carl Sagan (1980) noted that “the Hindu religion is the only one of the world’s great faiths dedicated to the idea that the Cosmos itself undergoes an immense, indeed an infinite, number of births and deaths. It is the only religion in which the time cycles described in Bhagavata Purana correspond to those of modern scientific cosmology. Hindus have always been independent thinkers. Freedom, liberty, independence, inventiveness, objectivity and openness were the hallmark of Bharata Mata’s mind. BHARATA MATA allowed them, embraced them, encouraged them, digested them, and practiced them to mold the mind of her children. Thousands of centuries ago they exercised their freedom to explore, expand, and travel to areas that are unknown to even to the present modern scientist. And this is the mind you have inherited. You need to be the champions of this freedom to move forward and help the human race to live in peace and prosperity, not fear, terror and torture. Hindu mind has always pushed every conceivable idea and every known theory to the ultimate with no inhibitions or no dictums or restrictions from the higher authorities. We never conquered, invaded, pillaged, terrorized, brutalized, converted forcefully, and destroyed their possessions. Bharata Mata was conquered and exploited by many countries over the last thousand years. Even her name was changed to a meaningless word – India. In the words of Former President: “Yet we have not done this to any other nation. We have not conquered anyone. We have not grabbed their land, their culture, their history and Tried to enforce our way of life on them. Why? Because we respect the freedom of others.” We always believed in Vasudaika kutumbam. Believed in inclusivity, not exclusivity, unity not divisions, and harmony not disharmony. Live let live is the cornerstone of Hinduism. But we should not allow our house to be blown away by other exclusive religions. We have to guard our universal values, freedom, independence and liberty from internal and external enemies. It is time to throw away the concept of secularism and proudly make Bharat a spiritual nation for the entire world. Be champions of this movement. Hindus should not sit idle, remain silent, stay as a spectator, and turn their heads the other way, when our Bharata Mata is being attacked. Select group of Hindu are responsible for suffocating, demeaning, denigrating, damaging, deprecating and disparaging our mother, that is mother India. It is our dharma to protect the mother that has made us what we are today. Some of her children are stabbing their mother, breaking her limbs, sacrificing her interests, and starving her by robbing her resources. But we cannot close our eyes, shut our mouth, plug our ears, tie our hands, chain our feet and ignore the impending danger of loosing our motherland. We all have to join the movement to protect her from being rooted out from this sacred land. Let us remember the words of Plato: "The price good men pay for indifference to public affairs is to be ruled by evil men." Otherwise, we have no place to run and no place to hide. That is the reason we must sacrifice our lives for Bharata Mata, that is the message of the song.